The importance of choosing a healthy puppy just can't be overstated.... but do you know how to recognize a pup who is strong and healthy? ....without stopping to be sure that he (or she) is healthy and strong and ready for her new home! But it's important to pay attention to the condition of any pup you're considering. Because if you don't take the time to look a little bit more closely you could be setting yourself (and your family) up for a lot of heartache, and quite possibly a lot of expense as well. On this page you'll find everything you need to help you pick a robust, healthy pup to add to your family - and avoid the costs of making a costly mistake. According to recent ASPCA research figures, the cost of owning a dog is somewhere around $1500 per year (more in the first year of puppyhood). For a medium-size dog who lives around 15 years that works out at a total cost of approximately $18,000+ over his/her lifetime. Now, that's a lot of money in anyone's books, but if you get a sickly pup who needs an above average amount of veterinary care those figures could end up being significantly higher. 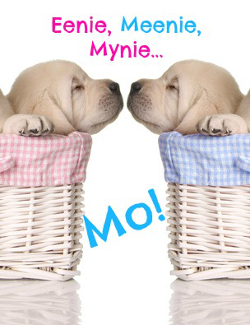 A puppy who isn't well bred and properly taken care of may cost less to begin with, but he (or she) will end up costing you a lot MORE in the long run! 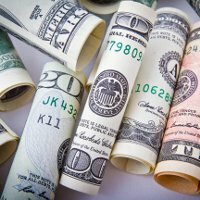 And there's more to consider than just the financial cost. If the pup you choose isn't strong and healthy, the heartache of watching him suffer (or even die) is a high price to pay, especially when children are involved. SO... to help you avoid these problems, I've put together a printable checklist that will help you evaluate any puppy quickly, so that you stand the best chance of bringing home a pup who will spend many happy, HEALTHY years with you and your family. A puppys' coat should be clean, and shiny. With no bare spots or red irritated areas. These indicate skin problems/allergies/mange etc. If he's been outside playing and has a little mud on him, that's okay, but a dirty, matted or coarse coat can mean worms - or improper care. A healthy puppy has clear, bright eyes and there shouldn't be any discharge from his nose. 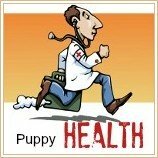 A healthy puppy shouldn't cough either. Your puppy's ears should be clean inside, with no sign of redness , irritation or discharge. A bad smell from his ears, or constant scratching at them or head-shaking are a red flag for ear mites, infection and so on. Obviously all puppies are different in this area, but you don't want a puppy who seems lethargic or listless. 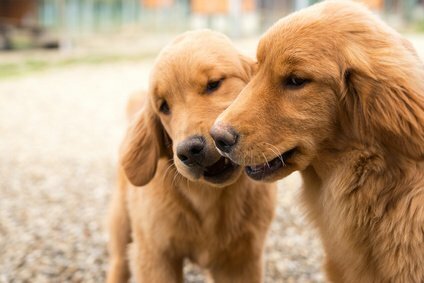 A pup who just seems a little more shy than his litter-mates is probably perfectly healthy, but one who is disinterested in you and his surroundings could be sick. These are the simplest and most basic things to look for and will help you notice some of the most common health problems that puppies are prone to. BUT it's also important to look at the parents of the puppies, and the environment that they are kept in. ... then chances are your pup has had a good start in life. Choosing a healthy puppy doesn't end here. Before you jump in the car and head home with your precious bundle of joy, be sure you have all the necessary paperwork in your hand. All puppies should come with a record of the veterinary care they've received, this should show the type and date of their vaccinations and when they were wormed. If you're buying a purebred puppy 'with papers', you should be given your puppy's Registration Application at the time of sale. Don't accept promises of 'papers in the mail', there's no reason for a responsible breeder not to have the necessary forms at hand. It's so exciting when you first bring home that new puppy, but that excitement can turn to frustration and disappointment if you don't know what to expect during those first few days, so make sure you've done your homework first! Plus, no matter how careful you've been to make sure you're choosing a healthy puppy, you need to have your veterinarian give your new furbaby a thorough physical exam within 24 - 48 hours of bringing him home. If this is your first pet, or you need help choosing a veterinarian for any reason, check out this page for all the tips and advice you need. If you've bought a purebred pup of show/work/breeding quality, you will probably have signed a contract with the breeder. Part of this contract will most likely have a clause that requires you to have him/her seen by your own vet within a certain period (usually 2-3 days) of receiving him/her. 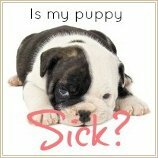 It's in your best interests to do this, if you should find that your pup is sick, or shows any signs of hereditary/genetic faults or weaknesses most breeders will take the puppy back and give you a replacement pup, or even a refund. This will depend upon the individual breeders contract though, so read the small print! Choosing a healthy puppy is fairly straightforward when you have the litter underfoot, but if you're buying a puppy online it can be a bit trickier. Although the majority of breeders are honest and ethical, this method of sale obviously leaves room for unscrupulous people to exploit the system, so make sure you do LOTS of research before you buy.. AND the veterinary check-up recommended above is absolutely vital to make that your little guy, or girl, is fit and strong. Now it's your responsibility to take care of your new puppy, and there are lots of pages on my website that can help you make sure he stays happy and healthy.